Apollo Electronic Cigarettes is very much a favorite for of our many reviewers for providing an excellent vaping experience. Apollo offers a really wide variety of devices. The popular and small sized electronic cigarettes are really top quality and have amazing vapor and flavor delivery. They also offer advanced vaporizers and we will go over each starter kit they have for you. Before we start, we should also add that Apollo is a leading manufacturer of various e-cig flavors so you have a great line of cartridges and e-liquids to pick from with refreshing new tastes being developed all the time. 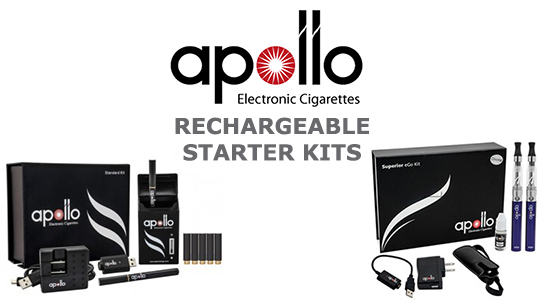 Now let’s look at all of the 4 starter kits offered by Apollo Electronic Cigarettes. The entry line Standard kit offers everything you need to get started and a bit more. Apollo calls it their bestselling kit and we know why. It comes with a portable charging case, which is usually an upgrade with most e-cig brands. 2 standard batteries that last 2 hours each, a 5 pack of flavor cartridges and a full USB and wall charging kit. The Extreme kit actually costs less than the Standard Apollo kit, simply because it does not feature a portable charging case. What it does feature, is Apollo’s Extreme batteries that last for up to 3 hours of continuous usage. The 5 pack of Extreme flavor cartomizers also last longer and make a better choice for heavy smokers. The kit includes specially matched Extreme USB and wall chargers with a bonus car charger. This is where things become more advanced, with Apollo’s eGo e-cigarette. It is larger in size and uses a refillable tank instead of convenient cartridges. It is for the more avid and advanced user but features a much larger battery that lasts up to 9 hours and CE4 Clearomizer tanks that produce more heat and vapor. You also get a bottle of e-liquid flavor of your choice and a USB and Wall charging kit. A lanyard pouch is also included to facilitate properly storing your eGo e-cig for transport. This kit feature’s Apollo’s Personal Vaporizer MOD. This device features variable power options and super long lasting batteries but is way bigger in size. If you do not know much about Personal Vaporizers, you can head to our PV page and learn more. We have also featured a full review of the Apollo VTube for a detailed look at the device here. It is certainly a larger investment but caters to the advanced user and techy who wants some fun and power factor with his or her vaporizer.